if anyone tattoos this or gets it tattooed i would love to see how it turns out! in the South Florida area called Salvation Tattoo Lounge. that helps students pay for school to become professional tattoo artists. shops. Below I listed some of the details for you to look over. thank you for your time and wish you a wonderful career. So talented, it truly is amazing. 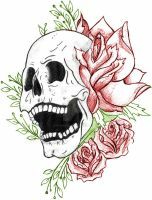 Would love to incorporate it into my sleeve if it only wasn't so big but couldn't live with the loss of quality. Doesn't change the fact that your a brilliant artist. Two thumbs up!! This is awesome and you're such an amazingly talented artist!